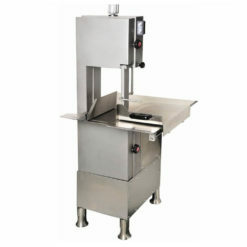 Commercial meat bone saws are indispensable for meat shops, meat processing plants, steakhouses or other places where large chunks of meat are handled. It allows to cuts tough bones and thick pieces of meat quickly. 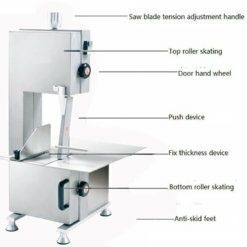 In addition, the electric blade provides a more precise cut than the butcher’s manual cutting of meat. 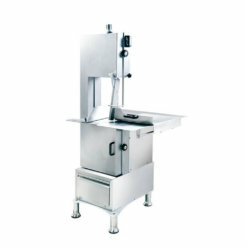 In addition to being powerful, every commercial meat bone saw is designed with safety in mind. These saws are equipped with easy access to a large button that can be turned off with a single click. 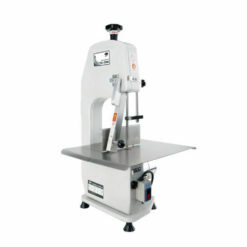 Each commercial bone saw can be conveniently placed on your countertop or equipment table. Choosing models with different power to meet your low capacity or high capacity. The saws are available in different blade sizes. 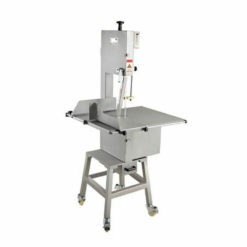 Using this machine to cut meat pieces quickly, easily and accurately, and cuts a variety of meats for easy splitting and display in your butcher’s or delicatessen. Its cast aluminum body construction ensures ruggedness and weight, while its stainless steel table often maintains long-lasting performance under normal use. 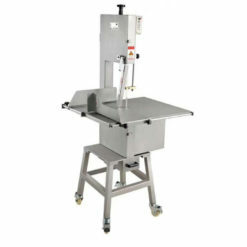 Bone saw machine is a food-processing machine specially designed for cutting freezing meat and bones into small pieces. 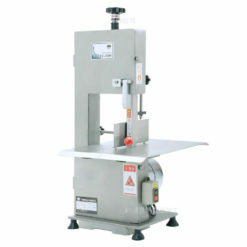 Bone saw machine features stable excellent performance, high efficiency, low power consumption, safe and eas.